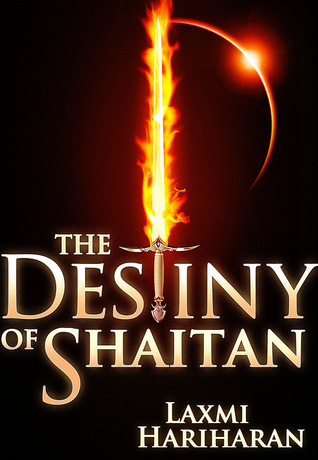 The Destiny of Shaitan (Chronicle of The Three, #1) by Laxmi Hariharan (Giveaway). Publication : March 17th 2012. Background: The Destiny of Shaitan, the first novel in The Chronicle of The Three series is a coming of age story, about a girl who falls in love only to realise that to be truly happy, she has to first find herself. Set in 3000 AD, when the galaxy is populated by humans as well as a half human, half alien race called half lives, this novel, tracks the protagonists from five to seventeen years old. Synopsis: When Tiina accompanies her ex-boyfriend Yudi on a mission to save the universe from the ruthless Shaitan, she seeks more than the end of the tyrant; she seeks herself. Driven by greed and fear for his own survival, Shaitan bulldozes his way through the galaxy, destroying everything in his path. Tiina wants Yudi to eliminate Shaitan, thus fulfilling the prophecy of the powerful autocrat being killed by his son, but she finds that Yudi is hesitant to do so. The final showdown between Yudi and Shaitan has unexpected consequences, for Shaitan will do anything in his power to win the fight—including getting rid of Tiina. The stakes are high and the combatants determined. Will Shaitan's ultimate destiny be fulfilled? Return to 7 Islands, (Chronicle of The Three, #2): The Destiny of Shaitan, ends with Tiina, leaving everything she knows—including Yudi and the world she helped save from Shaitan—in search of herself. The second novel in the series, titled Return to 7 Islands, follows Tiina as she lands in a futuristic Bombay—now reduced by a tsunami to its original seven islands—and helps Rai, in defending his childhood orphanage from the clutches of Sharmila, Shaitan's daughter. As she struggles to come to terms with her origins in an attempt to understand herself better, she discovers a surprise about her past. The lightning strikes him down, charring him black with smoke ebbing out, and he awakes to the gut-wrenching pain. Down below, he sees the aged Plutonian female going about her early morning ritual of dragging the large steel pole, bumping down the sleeping escalator steps. Every morning at five o’clock without fail, that annoying noise wakes him up. And every morning he looks out the window to see her walking down the escalator, which would normally be running in the upward direction if it were switched on. Why does she not take the path next to the escalator? It would make the going much easier for her. And where does she go with that one single steel pole every morning? He ponders her routine just as he has every morning. Another of life’s great mysteries…just like the question of who my real father is. The thought comes unbidden, as if the urban chemistry swirling in the air is mocking him. The smog of the early dawn creeps in—a reminder of the clogged, urban city where he lives—masking the scene below until all he can see is his own face reflected in his mind’s eye. Without turning, he reaches for the half-empty cigarette pack placed within arm’s length on the small wrought iron table on the terrace. He flicks on the vintage Ronson gas lighter, its golden casing long since rubbed away by frequent use to a dull brown. The cigarette paper crackles as it lights up. He pulls in a drag and exhales, watching the smoke as it melds with the smog, hitting the sticky side of the taller one hundred and eight storey-high apartment buildings on either side of the street. The smog slithers toward the other open window of the apartment diagonally opposite, where the young man living there often parades his women. His heart begins to beat in sync to the thump, kreeee, thump, kreeee, even as the sound fades. He shuts his eyes. I am safe. I am safe. No. I am scared, so scared. Feeling so helpless is unstoppable, and the sensation grows within him. After stubbing out the half-smoked cigarette with jerky movements, he reaches for another. He steels himself against the prick of consciousness that was bound to follow and continues to light his second cigarette of the day. As he pulls on the cigarette with his right hand, he plays with the faded Ronson in his left. Its smooth, much rubbed surface is a slight comfort. It’s the only reminder left of his father. Adopted father, he corrects himself. However much his logical mind tried to believe what Athira told him, his heart refused to listen. Athira would always remain both his father and mother. The man had not just raised him, but had showered him in love in a strong affectionate manner, which had bound them forever. As usual, thinking of Athira sends his mind into overdrive and he shuts his eyes against the pain. He can feel every separate beat of his heart, realise the full breadth of his life, and discern each individual moment in that space. So, this is how it feels to be powerless. His thoughts hang alongside the window and then hurtle against the glass, crashing into a thousand pieces in his mind. Stop! Breathe! He admonishes himself, and clinging on, tries to haul himself up. Mentally, he stays suspended over the precipice for a few seconds, and then he is there, back on stable ground. Yudi sighs and opens his eyes. Panic attacks have an annoying way of creeping up on him when he is at his most vulnerable. The images will come rushing back and once more his mind races over that well trodden memory path. 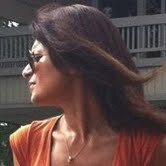 While born in India, Laxmi Hariharan has lived in Singapore and Hong Kong and is now based in London. She has written for various publications including The Times of India, The Independent, Inside Singapore, Inside Hong Kong and Asian Age. Indian mythology inspires her work. When not writing, this chai-swigging technophile enjoys long walks in the woods, growing eye-catching flowers and indulging her inner geek. Cool flaming sword. Thanks for giveaway. I liked the excerpt and the story looks like a good one.